I know I’m focusing most of my attention on women’s roles in WWI, but there are so many resources–both in print and online–detailing the decisive battles, the famous generals, and the carnage of the Great War (basically, men’s roles in the war). 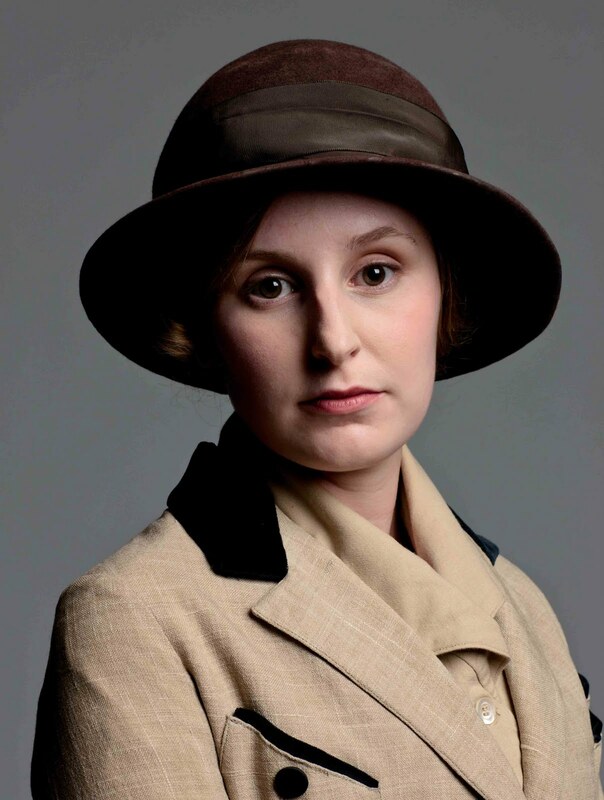 I don’t know about you, but I find WWI more interesting in regards to how it changed women’s lives, and this is especially so now that details of Downton Abbey’s second series have hit the internet. 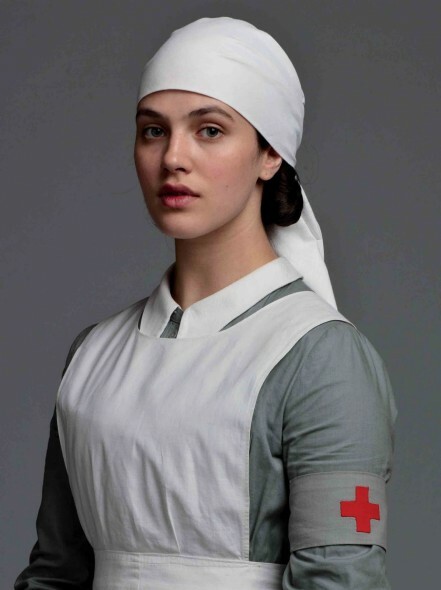 As seen in the promotional materials released to the public, Lady Sybil joins Queen Alexandra’s Imperial Military Nursing Service (QAIMNS), and Lady Edith is rumored to have something to do with farming and/or the estate, which leads me to presume that she joins the Women’s Land Army. I’ve done a bit of digging and have unearthed a plethora of information about women’s war work during the Great War, and it is shockingly broad in its scope. The 1922 edition of the Encyclopedia Britanica devotes nearly 20 pages to this topic, which ranged from civilian work (canteens, supplies, fundraising, etc), to military work (WRENs, WRAF, the Women’s Volunteer Reserve, etc), to factory work (munitions, shells, gas masks, etc), to medical work (nurses, doctors, ambulance drivers, etc), to replacing the absent men as tram conductors, police officers, and so on. I’ve uploaded a PDF of the section for your personal reading, which you can download at the bottom of this post. Since the Red Cross is pretty self-explanatory, I shall focus on the Women’s Land Army. Due to recruitment, enlistment, and in 1916, involuntary conscription, there was an acute shortage of manpower on Britain’s farms. During the Edwardian era, flower gardens and small holdings were the extent of ladies’ and women’s experiences with the land. As able-bodied men gradually trickled to the various Fronts, the Government faced a serious problem: if no one worked the land, there would be no food for the troops. By 1915, Britain had only three weeks of food supply left, and German U-boat action imperiled the shipping of foodstuffs, when the Board of Agriculture organised the Land Army. Lady Trudie Denman, chairwoman of the Women’s Institute Sub-Committee of the Agricultural Organisation Society, helped to spearhead the formation of the Women’s Land Army, and by 1917 (after sending agricultural officers around the UK to persuade farmers to take women as labourers and farm hands), over 250,000 – 260,000 women worked as farm labourers, with 20,000 in the land army itself. In Great Britain the services of women on land will be more imperatively needed than ever owing to the withdrawal at the end of May of the 40.000 soldiers lent by the Army to do the spring work in the fields. The new Women’s Land Army of the National Service is being organized to meet this need and the work is being greatly helped by the existence of a small nucleus of trained women, or at least of women with some experience on the land, known as the Women’s National Land Service Corps. In February, 1916, conditions having become serious and promising to be more so owing to continual drain of men off the land, the Women’s Farm and Garden Union, the only association which dealt with women’s outdoor work before the war, sent a deputation to the board of agriculture, with the result that in subsequent negotiations ground was allowed to the association for the training of women for land cultivation. This led to the immediate formation of the Women’s National Land Service Corps with headquarters in upper Baker Street in London, which were lent for the purpose by Lord Portman. About 2,000 women have joined the corps and have been placed on farms in various parts of the country. The recruiting of the right type of women for work on the land is essential to success, and since county committees dealt mainly with the enlistment of local resident women in country districts, it became the work of the corps to recruit suitable girls and women in the towns who could be sent to any district to supplement local labor. According to a statement of Mrs. Roland Wilkins, chairman of the corps, all the women enlisted in the corps have had a secondary education and have gone onto the land mostly from patriotic motives. The corps has not encouraged girls who had to live on their earnings to take up agricultural work because of the low rate of pay. Patriotic motives alone made it worth while to women to take up this hard work for such wages as would only provide them with the necessaries of life. It is for this reason that the chairman of the corps is not sanguine in the expectation of a large number of women continuing in agricultural professions at the close of the war. The value of educated women in the work which the corps is doing has been very clearly shown. Many members of the corps in taking up work on a farm have after a short time been asked by the farmer to see if they could not get the village women to give a helping hand, and in many cases they have succeeded in organizing the women into whole-time or part-time gangs. Force of example and a little persuasion are doing wonders in breaking down prejudice and timidity at embarking on unaccustomed work. The farmers have thus found the value of women’s aid and have been led to ask for their help. The corps has always dealt perfectly frankly with the farmers and has never led them to expect skilled labor where all they could be provided with was good but untrained material, which, at most, was no more experienced than a six weeks’ course can provide. As for the accommodation of the women, a cottage occupied by two or three women, which is the number generally sent out to work on a farm, is the arrangement preferred. They either cook their own meals or get a friend to live with them who will do the housework. Others live on the farm or take lodgings in the villages, but in the low-wage districts the amount earned barely covers the charge for board and lodging. In isolated districts the total lack of accommodation was often all that prevented farmers from applying for women laborers. During the training of the women, which takes place on a number of farms lent for the purpose to the parent association, the Women’s Farm and Garden Union, hotels are provided for the pupils by the Land Service Corps, which are run by a superintendent, who not only is housekeeper but also supervises the carrying out of the work to which she sets the pupils on the farm daily. Many women who applied to the corps to be put in the way of work on the land are sent to the National Service Land Army Organization, and they in turn send some of their applicants to the Women’s National Land Service Corps. The corps does not offer the advantages of full training and full traveling expenses and equipment, but, on the other hand, the women who become members of the corps do not engage themselves in quite the same way as the recruits of the Land Army of National Service. The only agency which offers such facilities for training to women anxious to do their share in helping their country and to whom the out-of-door life appeals more than work in factory or office is the national service department of the board of agriculture. Once the decision to go on the land is reached the first step for the recruit to take is to go to the nearest post office, obtain the necessary form, and sign it. In due time a business-like summons arrives, naming place and date and requesting her to appear before a joint committee of the employment exchange and the district selection and location committee of the Women’s War Agricultural Committee. A railway ticket to the place mentioned is also sent, and the future land worker eventually finds herself before the district selection and location committee. If she is accepted after the interview the committee decides whether she is sufficiently skilled to go straight to a farm as a paid worker or if she is suitable for a bursary—-i.e. 15s. ($3.65) a week—-in which case she is allocated direct to the farm on which she will work, or it may be decided to send her for 4 weeks to a training school. After certain formalities a return railway ticket is given to the recruit and she is told to await further orders. If she is fit to work on the land the committee proceeds to act on the decision arrived at during the interview. When a recruit is sent to a training school all particulars regarding her are first sent to the committee in the county town to which they have sent her instructions and a railway voucher. If the recruit’s work is satisfactory arrangements are made to place her upon a farm as soon as she is ready, and whenever possible a place is obtained for her in the locality where she was trained. Whenever a recruit is placed at work the village registrar or a specially appointed welfare worker visits her. and if any difficulty arises the recruit has someone to whom to appeal. The recruit is now a full-fledged war land worker, and if she should be dismissed from her employment through no fault of her can if she wishes it be sent back immediately to the county town. If she then wishes to return to her home at her own expense she can do so only with the permission of the district representative. This was a really interesting article. I’ve been reading WWI info for an MG novel I’m writing, and you are right. Info is usually about the front and how that affected the men. This was really helpful. Thank you Elizabeth. Plus, most information about women during the war tends to focus on WWII–the bravery and courage of WWI is often neglected. Have you ever read any of Berta Ruck’s novels? She wrote during this time period. One of her novel’s is “A Land Girls Love Story”. All of her novels are delightful. I have not! Thank you for the recommendation Mary Beth. This seems to be blushingly modest about women’s real motives. I think modern young women wanted to earn money, to be counted as self-determining adults, to do interesting work, to learn new skills and to be confidently contributing to the war effort – just like young men. I was particularly fascinated by the brave British women driving ambulances in France. Not only did they release the men for other work but the women themselves became very professional workers. Definitely. This goes hand-in-hand with forcing women out of the workforce when the veterans returned home from the trenches–women couldn’t possibly want to earn money, and since men do, they are more deserving of jobs! And women ambulance drivers are one of my favorite aspects about WWI. I can’t imagine what it was like to go from the gentle life of a lady to driving moaning, wounded soldiers across the Western Front. Scary, chilling, and outrageous.